The bomb threat at an Alabama strip mall was met by a robust response—bomb technicians from around the country armed with X-ray gear, robot technology, and the latest intelligence about improvised explosive devices. 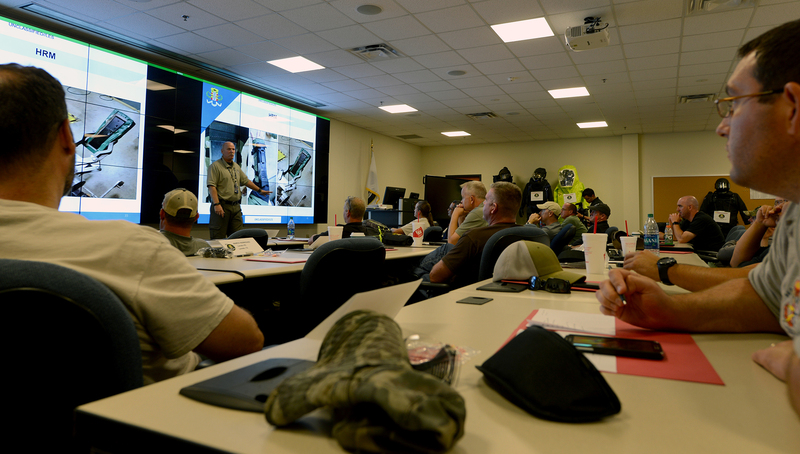 The exercise, held on the training grounds of the FBI’s Hazardous Devices School at Redstone Arsenal in Huntsville, was a scenario designed to inform new and experienced bomb technicians on the myriad threats they could face on the job. The school, established in 1971 and run jointly by the FBI and the U.S. Army until last September, when the FBI accepted primary responsibility, has provided training to more than 20,000 local, state, and federal first responders and bomb techs. It is the only facility in the country that trains and certifies the nation’s public safety bomb technicians. 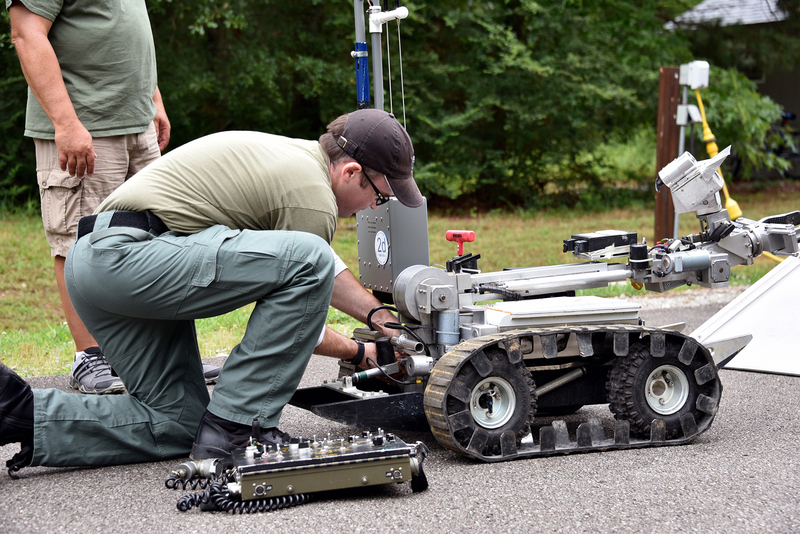 The FBI’s Hazardous Devices School at Redstone Arsenal in Huntsville, Alabama, plays a key role in training and certifying all of the nation’s public safety bomb technicians. The facility is home to a sprawling 455-acre campus complete with classrooms, explosive ranges, and mock villages that include a train station, apartment complexes, a movie theater, and a strip mall. New bomb technicians spend six weeks learning about electricity, fuses, and improvised explosives. Their certification ensures they will be operating from the same playbook as every other bomb tech in the country. During one recent exercise, students searching a village bookstore found a pressure cooker similar to one used in the Boston Marathon bombing in 2013, along with crude bomb-making material and anti-government propaganda. They had to devise an approach: Disable it in place? Remove it? The scenarios are often developed based on real-world events. Get a closer look at bomb disposal robot training at the FBI’s Hazardous Devices School in this 360 video. Across campus, another group of trainees learns how to remotely navigate robots on stairs and through a maze of barriers. The exercise simulates how bomb techs may have to pilot robots through multi-floor buildings and confined spaces. “This is an ever-changing syllabus for the students, because we want them to learn what we know based on intelligence and teach them those skills in the real world,” said Mark Vargos, an instructor at the school. Kelly Boaz, an instructor at the FBI’s Hazardous Devices School, briefs public safety bomb techs from around the country on the latest trends during classroom training. A mixture of classroom and field training ensures the trainees are ready to handle dangerous threats when they return home. “Our goal is, if they leave here on Friday and go to work on Monday and they get a bomb call, they should feel absolutely comfortable—based on the training they receive—that they’re going to survive that call and go home,” said Stewart. 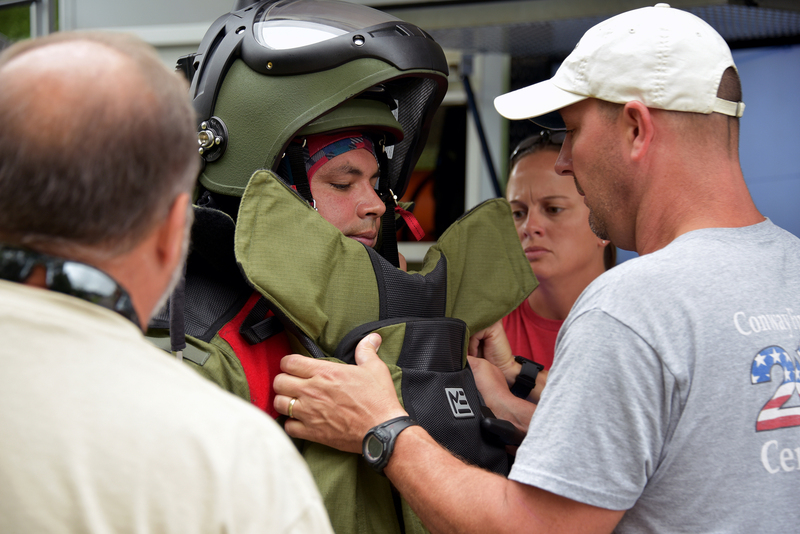 Students help Miami Police Department Detective Robert Rodriguez don a bomb suit before investigating a simulated threat at the FBI’s Hazardous Devices School at Redstone Arsenal in Huntsville, Alabama. Detective Robert Rodriguez, a bomb technician for the Miami Police Department, recently attended a refresher course at the Hazardous Devices School, repeatedly donning an 80-pound protective suit under the hot Alabama sun. Technicians must be recertified every three years. In one exercise, he helped his squad move a pressure cooker bomb with a robot so it could be detonated remotely inside a sandbag bunker. Robots are often used as the first line of defense in response to a bomb threat; learning how to use such an advanced tool is a primary training component at the FBI’s Hazardous Devices School. The FBI is upgrading and expanding the school, which has trained each of the country’s 3,100 bomb technicians—a figure that does not include the military’s explosive ordnance disposal (EOD) technicians. The growth and expansion reflects the need to stay ahead of any emerging threats. The FBI is hoping to generate new leads with the release of age-progressed images of four alleged terrorists involved in the 1986 hijacking of Pan Am Flight 73 in Pakistan that killed two Americans. The CFO of a non-profit organization that helped find affordable housing for the elderly, homeless families, and the mentally disabled has been sentenced for stealing federal housing funds.